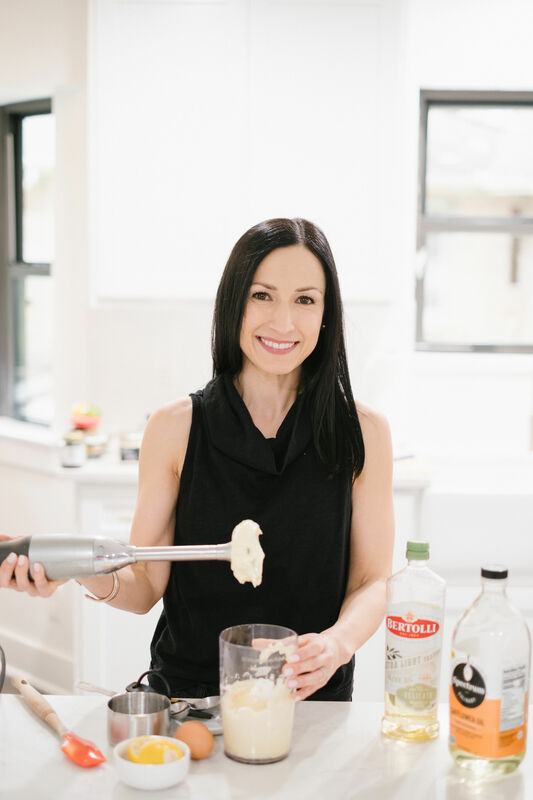 If it’s your first time doing the Whole30 you might be thinking, “What’s the deal with mayo and Whole30?” I asked the same thing! Before Whole30 I actually didn’t like mayo or ranch. In my mind they were fat/calorie filled condiments to avoid/limit. 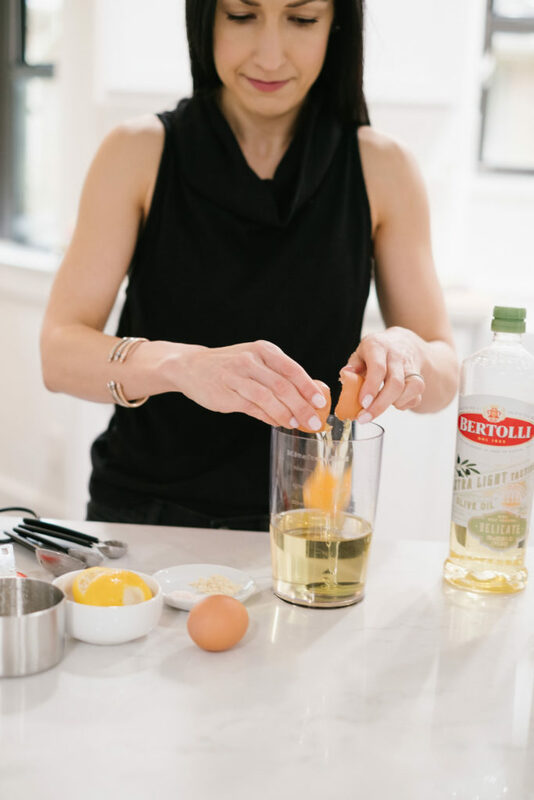 Whole30 taught me fat is good and is an important part of my balanced plate (see the meal template)! Once I started experimenting with these fresh homemade mayos and dressings, our meals became more interesting! Not to mention, kids (and adults!) are more apt to eat their veggies and protein if they have something yummy to dip them in. 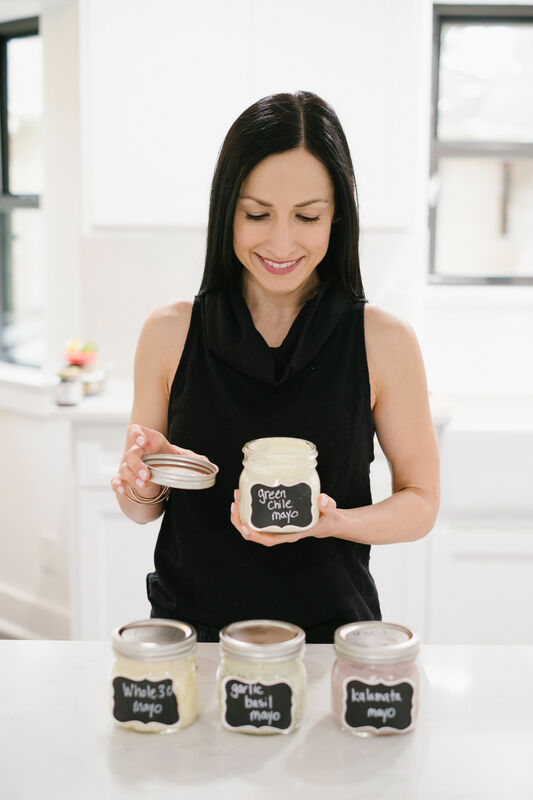 Today I’m sharing the basic recipe I use for Whole30 Mayo and 3 other Whole30 compliant, flavor-packed mayo/aioli variations to try at home (all recipes below). Make the basic mayo first then it’s easy to make any of the flavored varieties! 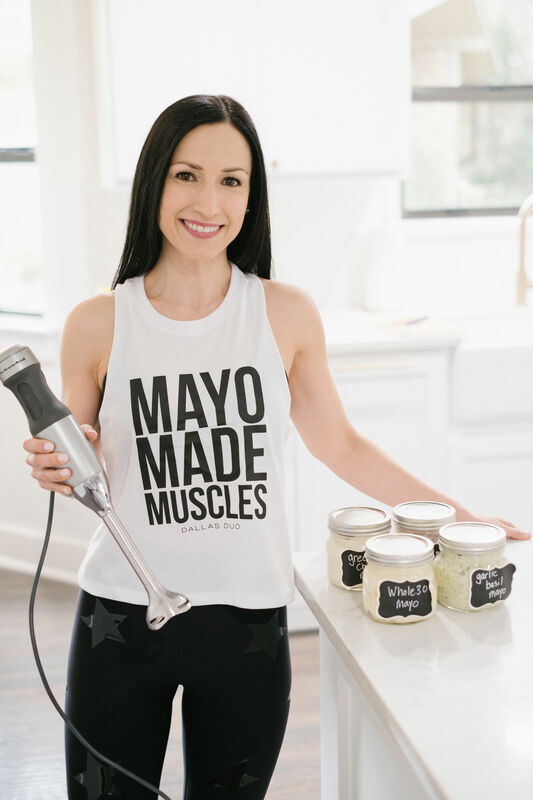 And, don’t miss our giveaway on instagram that includes an immersion blender and Dallas Duo tee or tank! 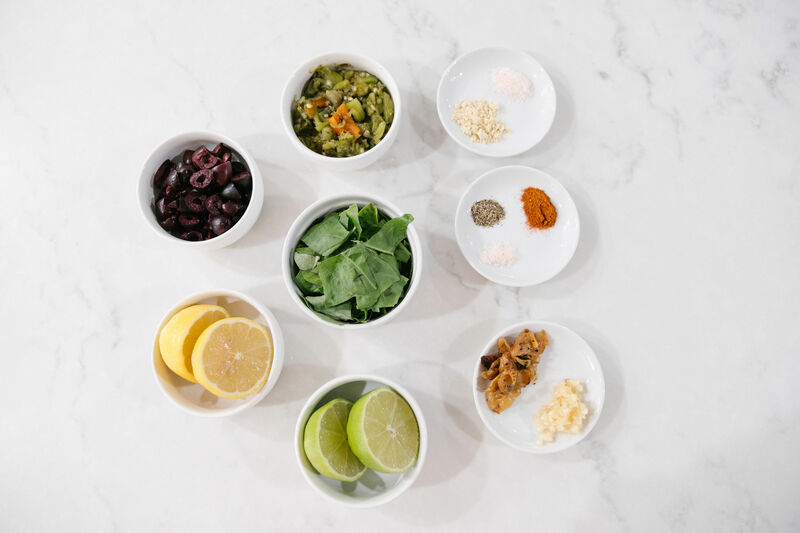 Kalamata Mayo– inspired by the kalamata olive aioli served at Nordstrom! I adapted the recipe, and I think it tastes exactly the same! Green Chile Mayo– Being from Northern New Mexico (Taos), I love Green Chile, so of course I had to create a version that included it! Garlic Basil Mayo– One of my favorite flavor profiles to amp up chicken, fish, and shrimp! I did my first Whole30 in 2013, “back in the day” when there weren’t store bought mayo options. If you wanted mayo or dressings you had to make them! I wasn’t very confident in the kitchen, hesitant to attempt DIY. 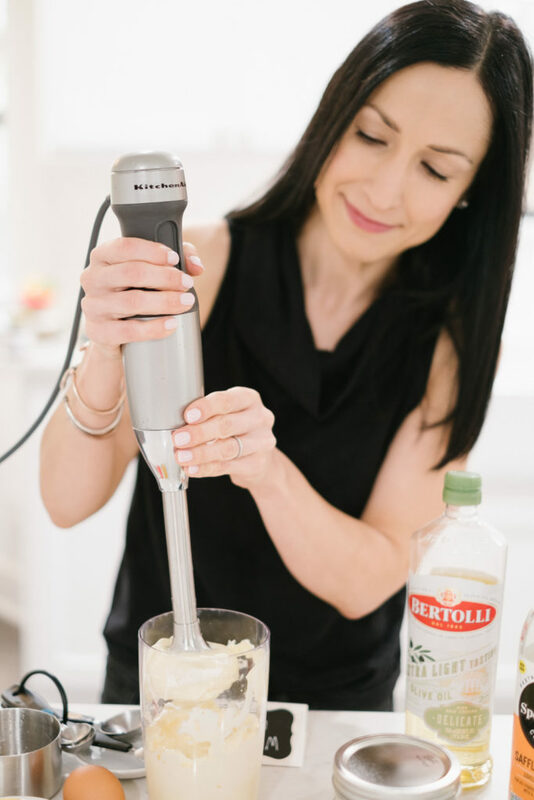 The immersion blender seemed less intimidating than other fancy blenders so I gave it a shot and it became my go-to! It takes up little space in my kitchen, fits easily in a drawer. It’s easy to use, even for novices (like me!) and is older kid/ teenager friendly. Recruit some help in the kitchen and let them be creative with ingredients/recipes! 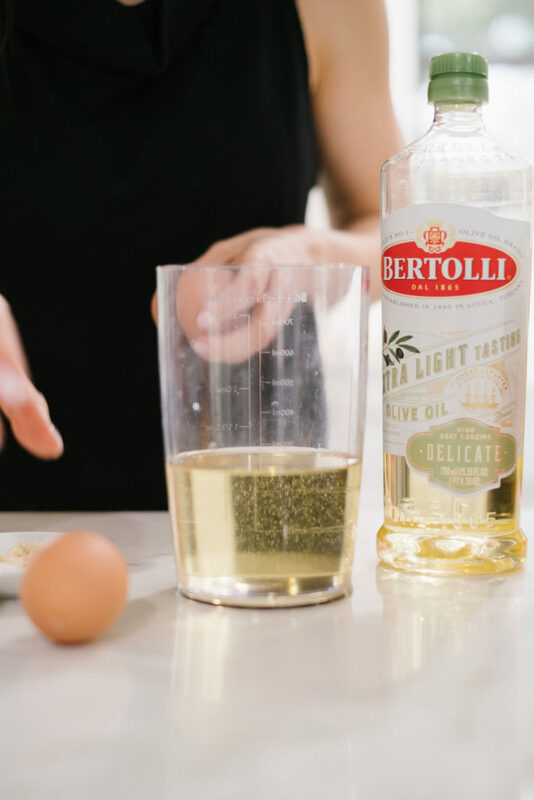 For best results, use extra light tasting olive oil or safflower oil. They have a mild flavor that is best for mayo and dressings. 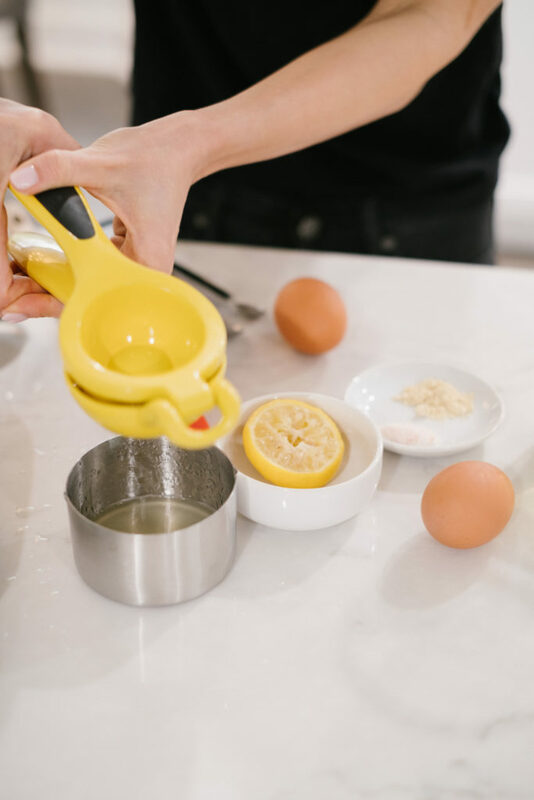 Be sure immersion blender is placed over over the egg before you start the blender, press the start button and hold over the egg for a few seconds until you see it start to emulsify. Then, slowly pull up and allow the rest of ingredients to integrate/mix. If you end up with a mayo fail (didn’t emulsify) try adding another egg. 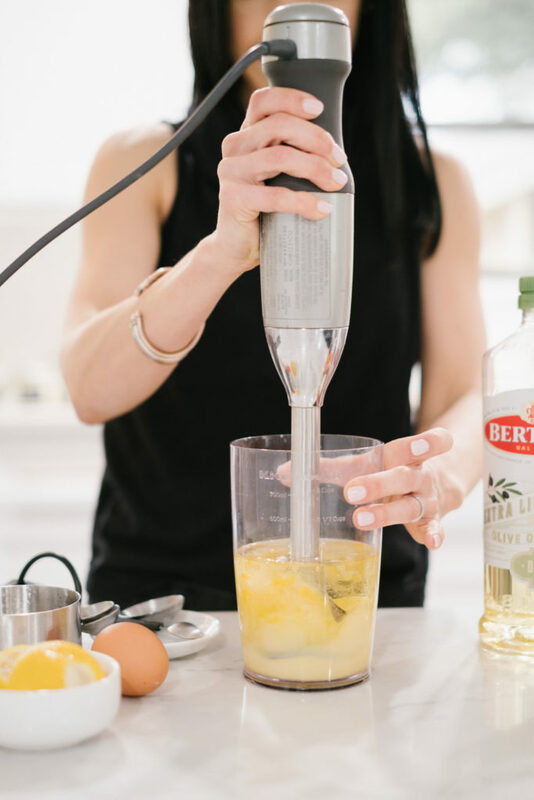 To clean the immersion blender, place a drop of dish soap in an empty jar and fill halfway with warm water. Run the immersion blender and let the soapy water do it’s job on the blade. You can wash the wand again if needed, but this really helps get the mayo off the blade area safely! Pour the oil into a measuring cup or wide mouth mason jar. Add egg, lemon juice, salt, and mustard. 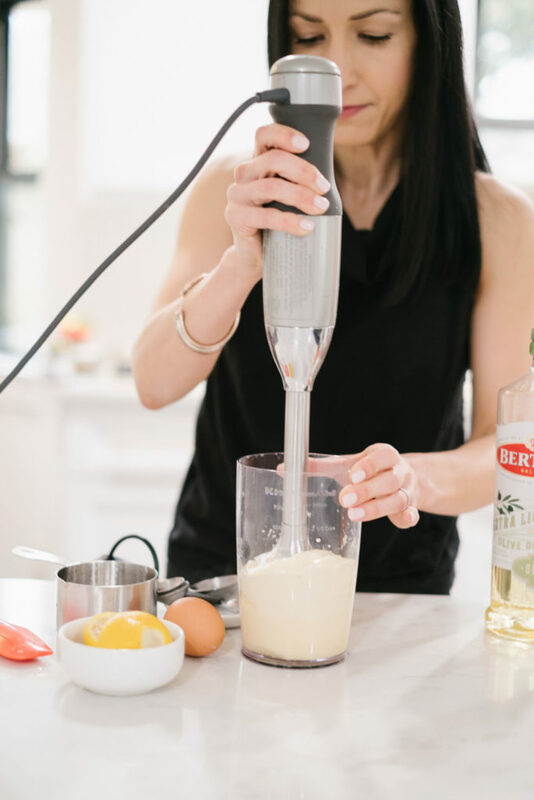 Be sure immersion blender is placed over over the egg before you start the blender, press the start button and hold over the egg for a few seconds until you see it start to emulsify. Then, slowly pull up and allow the rest of ingredients to integrate/mix. Makes approx 12 oz mayo. Start with the mayo in a jar or measuring cup. Add all ingredients and blend until well combined and you achieve a light purple shade. Start with the mayo in a jar or measuring cup. Add all ingredients and blend until well combined. Place basil, garlic, salt, cayenne pepper in a jar or measuring cup and pulse with blender until finely chopped. Add 1 cup Whole30 mayo and blend until smooth. The flavors will develop as time passes, I recommend waiting at least an hour before serving. Top your protein with a dollop (about a tablespoon) of mayo…great on beef, chicken, or fish! Dip veggies (cooked or raw), roasted potatoes, or meat in it. Spread on a lettuce wrap with thinly sliced turkey, tomatoes, and cucumbers, then fold or roll it up. Crisp and refreshing! In a protein salad as the “binder” to create tuna or chicken salads with your favorite mix-ins. 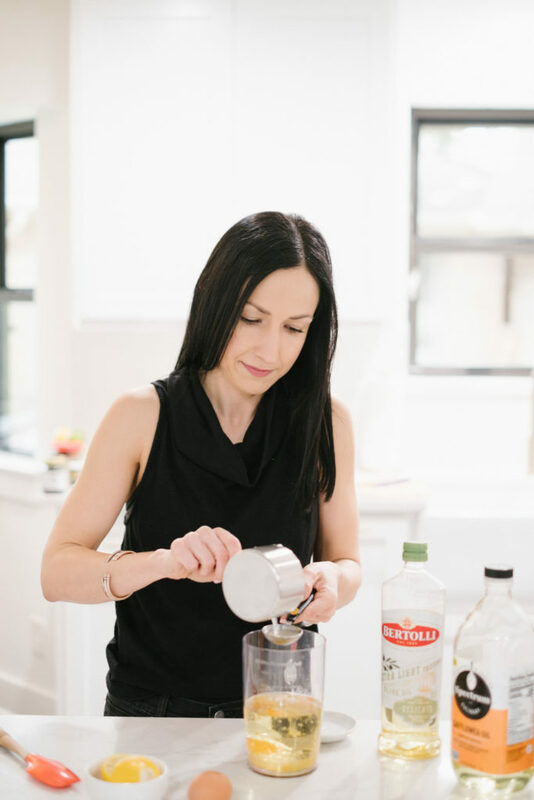 Shop the Post: Whole30 Mayo at Home! 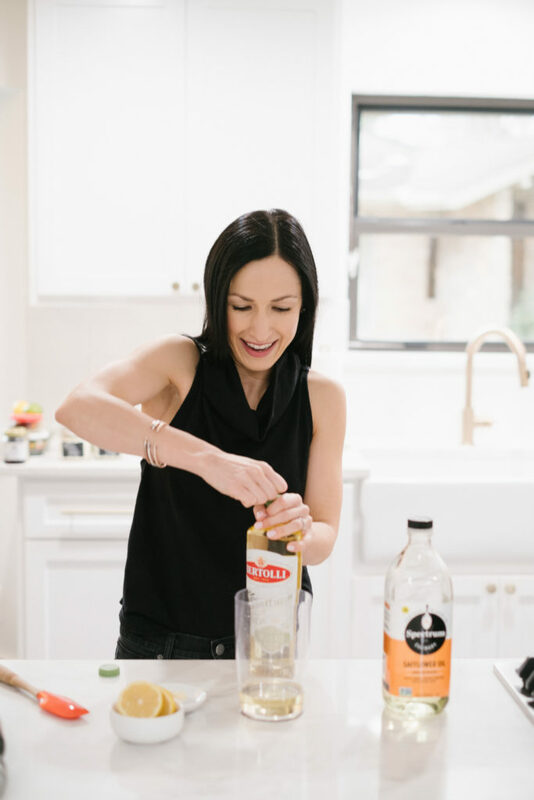 previous article: Whole30 Dallas Duo FREE Interest Event, January 3rd! 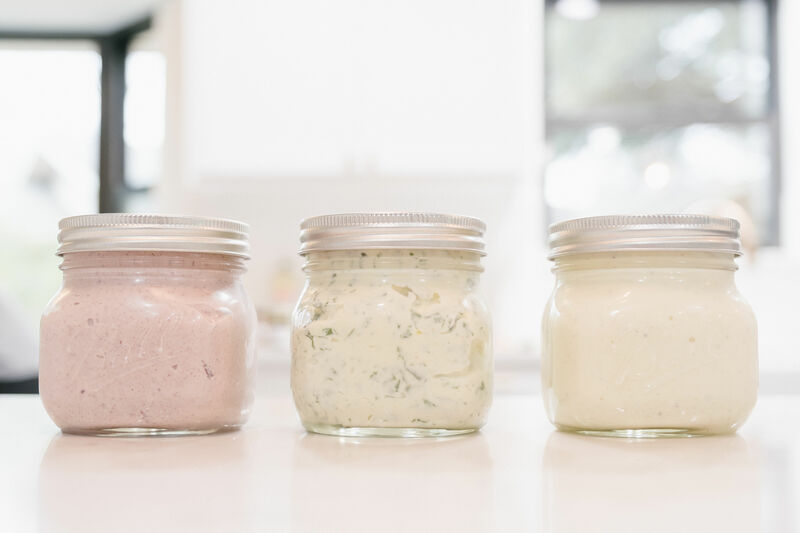 I love Whole30 homemade mayo. Can’t wait to make your green chile and garlic basil mayos! I can’t wait to try the garlic basil mayo!! Me and my husband love all things “pesto” and have been craving a pesto ish mayo to pair with chicken or fish during our whole30 this month! I can’t wait to try the Green Chile Mayo. All the mayos sound wonderful but thinking about the green chili is making me drool!! These sound great! 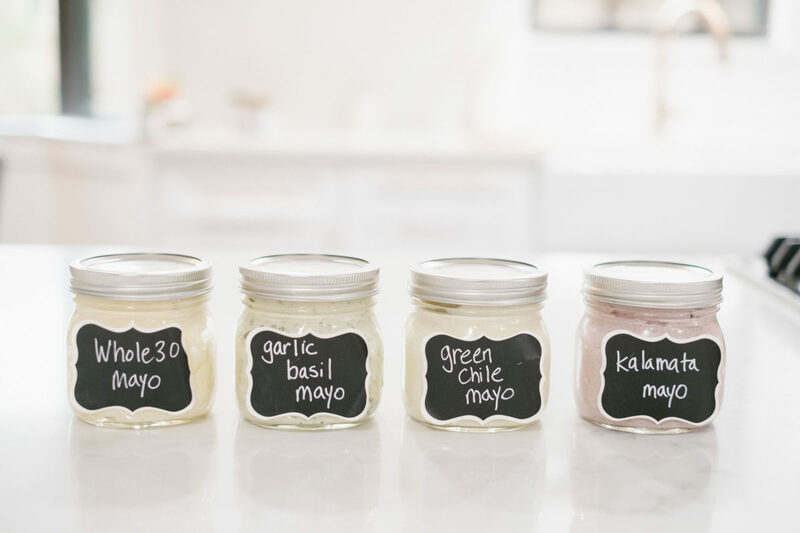 I’m not a big mayo/ranch fan myself, but I’m intrigued to try DIY! I can’t wait to try green Chile mayo ! Not really that much into condiments except for my obsession with Mayo! I started out with making whole 30 dinners before diving into the entire 30 days and I’ve been lazy and not making my own sauces (usually just don’t add it) but now with these easy recipes I can definitely do it! I can’t wait to try the garlic basil mayo! Yumm!! They all look great. Think I’m going to make the garlic basil first. Thanks for sharing your recipes. Love the Garlic basil mayo the best! Trying that this week! Thanks for showing us how easy it is to make! I would like to try the basic mayo because I am, well..basic. Thank you for sharing! Haha…I’m basic too 😉 Hope you enjoy the recipes! It’s been forever since I made mayonnaise, but your post has me wanting to do it again. My favorite is the Garlic Basil Mayo. Thank you 🙂 I hope you enjoy the recipes!